People who enjoy paintballing have been urged to make sure they take care of their eyes while taking part in the sport. Writing in the Norwich Bulletin, Dr Anthony Alessi, chief of Neurology at the William W Backus Hospital in Conneticut, states that while the game is lots of fun, shooting paintballs has resulted in an increasing number of people suffering severe injuries to their eyes. 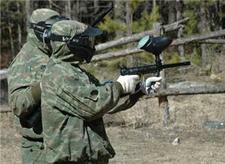 "Organised paintball requires the use of a hard plastic mask with eye protection. No eye injuries have been reported when it is worn properly," he adds. He notes medical staff are increasingly treating patients who have been injured while taking part in paintballing tournaments, noting some people have suffered partial permanent vision loss and severely traumatised eyes can lose vision altogether. Web resource Contactlenses.co.uk notes wearing contact lenses for sports is a more stable and flexible form of vision correction than glasses and recommends soft contact lenses if the pastime involves vigorous exercise.